A material known as gallium nitride (GaN), poised to become the next semiconductor for power electronics, could be also essential for various space applications. Yuji Zhao, an expert in electrical and computer engineering at Arizona State University (ASU), plans to develop the first ever processor from gallium nitride, which could revolutionize future space exploration missions. Gallium nitride is a semiconductor compound commonly used in light-emitting diodes (LEDs). The material has the ability to conduct electrons more than 1,000 times more efficiently than silicon. It outstrips silicon in speed, temperature, power handling and is expected to replace it when silicon-based devices will reach their limits. Besides LEDs, GaN can be used in the production of semiconductor power devices as well as RF components. Now, Yuji Zhao aims to use this material to develop a high-temperature microprocessor for space applications. He received a three-year $750,000 grant from NASA’s Hot Operating Temperature Technology (HOTTech) program for his project. 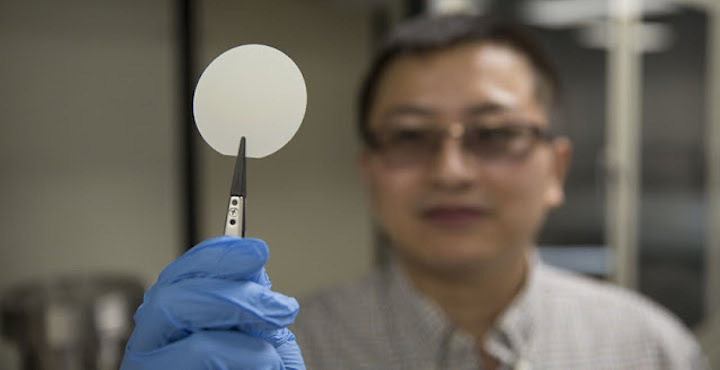 “This material can enable electronics system with greater efficiency, much reduced size and weight, and higher operation temperature, all of which are highly desirable for various space applications,” Zhao told Astrowatch.net. Zhao noted that due to the intrinsic properties of silicon, integrated circuits (IC) based on this material malfunction at high temperature (about 300 degrees Celsius) and operate at low frequency. GaN material is thermally robust and chemically stable, good at handling high temperature and radiation environments. Moreover, the GaN high electron mobility transistor (HEMT) technology allows monolithic integration of various GaN-based devices with ultrafast frequency response (100x) due to the two-dimensional electron gas. The project to develop the first gallium nitride-based microprocessor is very challenging and will probably take a lot of trial-and-error. “The main challenges come from three aspects: device, system and reliability. On devices level, thermally stable GaN enhance/depletion-mode n-type and p-type metal-oxide-semiconductor transistors must be demonstrated. This requires special growth techniques, structure designs and contacts. On system level, it is important to develop IC building blocks such as NOR gate and NAND gate, using GaN transistors. And GaN chip design and fabrication are very different from that of silicon chips,” Zhao revealed. Under the HOTTech program, Zhao plans to demonstrate a GaN-based microprocessor that can work efficiently under high temperatures above 500 degrees Celsius. Working towards this goal studies will be performed on the high temperature properties of GaN devices including material defects, electron transports, and thermal stabilities, and their impacts on the performance and reliabilities of GaN microprocessors. The goal of the HOTTech program is to develop and mature technologies that will enable, significantly enhance, or reduce technical risk for in-situ missions to high-temperature environments with temperatures approaching 500 degrees Celsius or higher. Such next-generation technology would enable exploration of high-temperature worlds in our Solar System. “This material will be needed the most for the missions with high temperature destinations. For NASA, this project would be beneficial for numerous missions, especially for the Science Mission Directorate missions focused on destinations with high-temperature environments, such as the Venus surface, Mercury, or the deep atmosphere of gas giants,” Zhao said. Given that the process of developing GaN-based microprocessor is expected to be challenging and lengthy, it is difficult to estimate when NASA could launch its first space exploration mission equipped in such device. However, Zhao hopes that promising results could come within 10 years from now. “We will be very happy if we can see some real useful technology coming of this research for NASA in a decade frame,” he concluded.